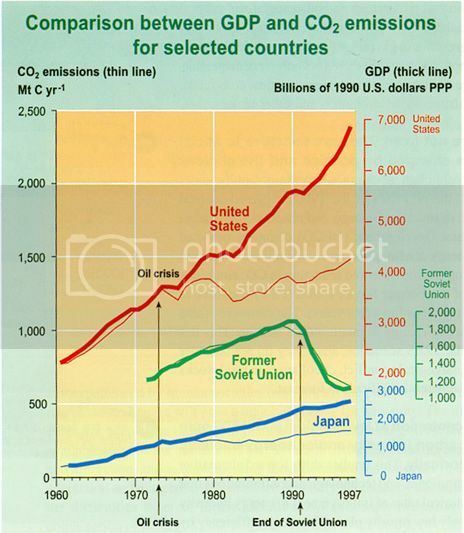 Economic indicator (GDP, thick lines) versus megaton CO2 emissions (thin lines) for several developed countries. Tropical forests exist in a rapidly changing global climate. Those changes are mainly due to the rising presence of trace gases (greenhouse gases) such as carbon dioxide, methane, nitrous oxide and fluorocarbons. The increase of these gases, and their deleterious impact, can largely be traced to the development of humans and their consequent energy consumption. Several economic indicators can be used to measure the correlation between human behavior on the ground and its effect on climate, including energy use, population (in the developing world) and most importantly GDP. A 2001 report from the Intergovernmental Panel on Climate Change shows a clear link between GDP and CO2 emissions (see figure on the right). A whopping 20% of CO2 emissions can be linked to deforestation, particularly in South America, Africa, and Southeast Asia, as can be seen below. The primary aim of deforestation is development, which results in a direct increase of CO2 in the atmosphere but also results in an overall loss of forest biomass, which is no longer capable of absorbing CO2. By far the largest rainforest, and the largest swatch of deforestation, rests in Brazil’s Amazon. Covering about 87% of their original extent, the forests of Amazonia host a quarter of the world’s terrestrial species and account for 15% of terrestrial photosynthesis. Deforested land in Brazil has either remained cropland (6%), been converted to pastures (62%) or for regrowing vegetation (32%). Human activity has included logging, hunting, and fire leakage. 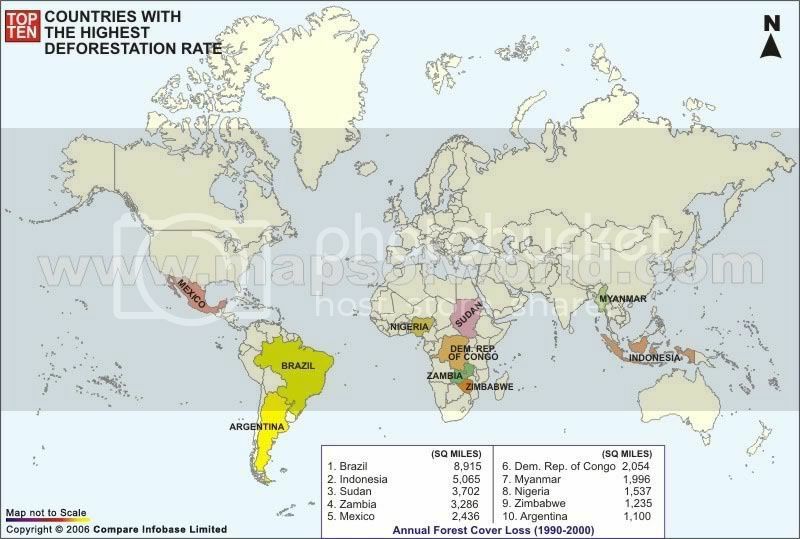 Top ten countries affected by deforestation. At the top of the list? Brazil, home of the Amazon. ©Maps of the World, all rights reserved. Carbon emissions (in metric tons/hectacre) from tropical deforestation compared to other agricultural processes. ©2009 Science Magazine, all rights reserved. 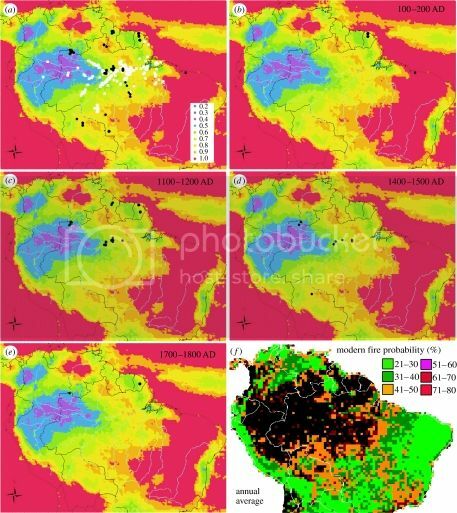 Fire probability in the Amazon's modern age juxtaposed with historical precipitation from soil analysis from AD100 on. Photo courtesy of Professor M.B. Bush of the Florida Institute of Technology. The climate change effects within Brazil’s Amazon forests have been swift and severe: a decrease in rainfall, longer dry seasons, and the potential of prolonged droughts. Temperatures, which had been warming at about 0.25 ?C per decade, are expected to rise about 3.3 ?C this century. Not significant, you say? At the end of the last glacial period, the Amazon warmed only ~0.1 ?C per century. The figure on the right shows current fire probability, the highest rates of which have greatly expanded from areas with traditionally low historical precipitation (blue and purple). The bottom line? If deforestation is not mitigated, and we continue with “business as usual”, the Amazon rain forests will continue to be ravaged. A scientific model (see below picture) shows deforestation in 2050 (in red) under current rates (panel A) and increased governance scenarios (panel B). Two models of deforestation in 2050, under A) the current system and B) increased governance. lines of solving this crisis. Mr. Cunha is the President of the National Council of Rubber Tappers, an organization formed by Chico Mendes (who was assassinated in 1988) devoted to protecting Amazon forests managed by their traditional inhabitants. He is responsible for 88 Reserves that cover over 20 million hectacres of the Amazon. He is a passionate advocate of agrarian reform, a manager of the pilot program extractive reserves project (RESEX), and a coordinator for project strengthening and development with other leading Brazilian organizations. Oh and by the way? He has no formal education. A child of rubber tappers, he never learned to read, and never had a necessity to do so. 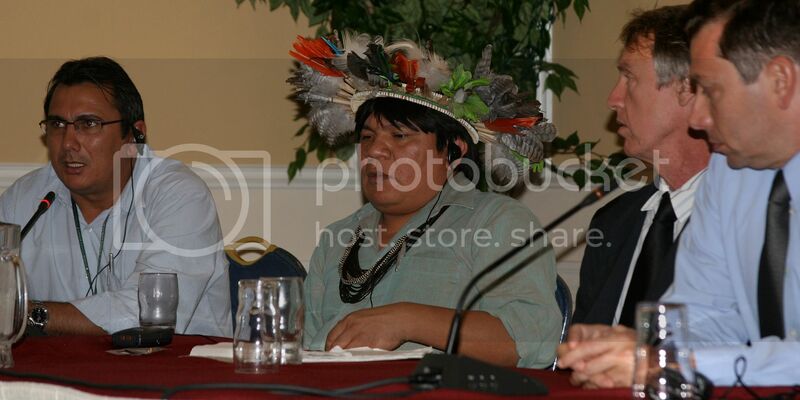 He never could have imagined his commitment to the cause of the Amazon people leading him, along with his fellow panelists, to a climate change conference in Copenhagen. In the mid-1980s, Mr. Cunha became involved with several grassroots social movements that were comprised of workers, who had the most incentive to strengthen local organizations and improve the quality of life for families. The focus, all along, was on conservation. The populations in these areas had the historic experience of living in the forest and were dependent on policies carried out by the government. These populations are also more vulnerable, as they live on the borders of heavy deforestation, where up to 50% of forests are being lost. With $17 million in funding from the World Bank, the Extractive Reserves Project ($17 million) has provided support to the first and largest extractive reserves established in Brazil. These four reserves cover 2.1 million hectares  an area half the size of Switzerland. The Project results include progress on: completing the legalization of the reserves, strengthening local community organizations, installing needed infrastructure, and improving subsistence and commercial production. New products and techniques that the project is helping to introduce include: use of medicinal plants, development of eco-tourism, cultivation and use of natural vines, production of handicrafts, and use of fallen timber for small-scale wood processing. Dr. Stella is an ecologist and project coordinator of climate change at the Institute for Environmental Research of Amazonia (IPAM). He is coordinating a United Nations-funded project entitled “Reducing Emissions from Deforestation and Degradation (REDD). The core principles of the REDD program involve identifying the drivers and vectors of deforestation (loggers, cattle ranchers and small land owners) and conservation (rubber tappers, local inhabitants) and fostering agricultural productivity through self-sustaining technology. The criteria for funding include fair distribution of money to the local families, additional efforts in other developing countries and transparency and respect for people’s rights. An Amazon pilot project was centered near the Trans-Amazonic roads, some of the oldest in Brazil, which are a contributing cause of deforestation by proximity and mobility. 350 small producer families, overseeing an average of 90.7 hectacres each, were chosen for the project, the aim of which was to produce financial incentives for sustainability. With the participation of the Amazon families, 3.2 million tons of CO2 have been stopped in Brazil, at a cost of only $12.7 million USD. That translates to $4.05 per ton of carbon saved. The cost of carbon reduction per ton in the State of California? $30-50 in a thermal plant. The Brazilian model, simple, effective, inclusive, could teach the United States and other countries a lot about climate reduction and making lives better. To read more about REDD, click here. 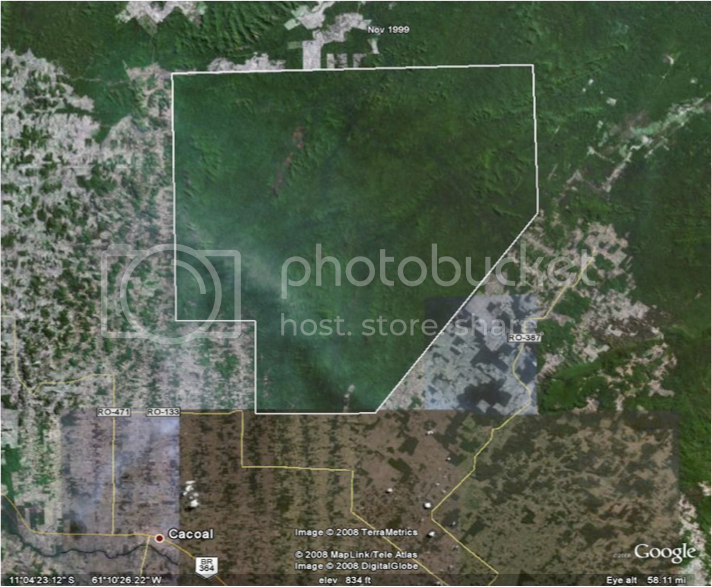 Imaging and monitoring of the Surui territory (outlined in white), a project undertaken in coordination with Google Earth. 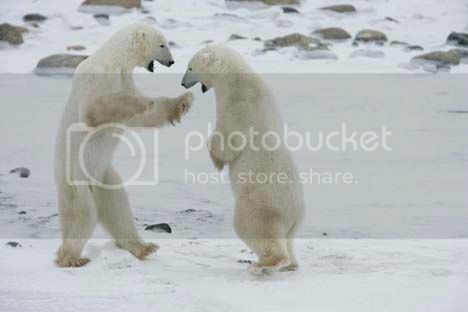 Image ©Google, all rights reserved. Perhaps the most special moment of the seminar was the participation and message of Chief Almir (yes, a bona fide Amazon chief!). Chief Almir is the General Coordinator of the Metareila Association of the Surui Indigenous People, inhabitants of the Rondonia state in Brazilian Amazon. With a total population of 1,200 people spread across 24 villages comprising about 248,000 hectacres of forests, they are one of the most isolated people on Earth. The Suruí only recently established contact with mainstream society, in 1969. Since then, they have struggled with the combined pressures of cultural degradation and environmental devastation. The Surui people were almost wiped out by disease, but had historically relied only on the bow and arrow as a weapon of justice and self-defense. After their population dwindled to 300 from it’s height of 5,000 people, the Surui realized their best, and first legal, weapon was communication. To help preserve their territory, they learned Portugese and undertook an ambitious 100% indigenous effort to reverse the deforestation of the loggers and modern invaders and to gain recognition by the Brazilian government. Today, the Surui are one of the first indigenous people of South America to use high-tech tools (Google Earth, handheld GPS devices) to police their territory. In cooperation with Google Earth Outreach, they can request more detailed satellite photos when they spot suspicious areas. If loggers or miners are detected, they refer the case to the authorities who have them removed. 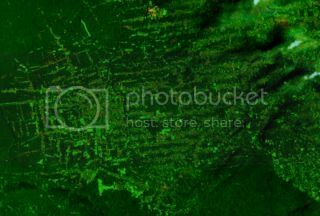 Deforestation of the Surui territory in Rondona, as observed by NASA satellite imagery. ©NASA, all rights reserved. 2006: Articulated a partnership of a 50-year beta project to study and understand the carbon process of the forest. 2009: Undertaking legal communication with the Brazilian government to facilitate ethnographic studies, reforesting activities, coordinating visits on deforestation and Surui anthropology, forming partnerships for future reforestation plans and instituting a carbon project to sell carbon for the benefit of the Surui people. So far, the project seems to be a raving success, as evidenced by a 2008 visit from the Prince’s Rainforest Project to the new indigenous cultural center that Chief Almir helped to erect. The Chief has been named director of the Ethno-Environmental Department of the Coordination of Indigenous Organizations of the Brazilian Amazon, which he proudly represented at the United Nations Climate Change Conference in Bali. Dr. Schwartzman is an anthropologist leading the Environmental Defense Fund’s effort to reduce emissions from deforestation in developing countries. He has lived among the native Panará tribe and learned their language, helping the emerging rubber tappers’ movement since 1985. He closed the panel by remarking that although 15-20% of all carbon emissions, definitively the most significant component of climate change, are caused by deforestation, the current Kyoto Protocol does nothing to stop it, while the social organizations in the Amazon have done tremendous amounts since the 1970s. Their model has been adopted by Papua New Guinea and has sparked collaboration with California and the United States Government. In fact, two bills currently in the US Congress, the Waxman-Markey bill and the Kerry-Boxer bill create provisions for reduced international deforestation via offset credits. of national parks in the United States by our biggest environmentalist president, Teddy Roosevelt. Together with Brazil’s famous explorer Mariano da Silva Rondon, Roosevelt explored the uncharted, punishing territory of none other than the Brazilian Amazon, chronicled in the novel The River of Doubt, as a vision of conservation and inspiration. The forests that existed during his time in the United States have been virtually eradicated. However, the Amazon basin is still in the early stages of ruin, and is resilient enough to recover, but only if we act today. The inspiring story of the Brazilian activists’ success highlights that change is most often less a function of power and social standing than it is passion, organization and persistence. Chief Surui and his people didn’t have wealth, influence or even formal educations. Rubber Tappers Leader Mr. Cunha, who is admittedly illiterate, hadn’t even seen a PowerPoint presentation before his trip to Los Angeles a couple of weeks ago. But they had ethnographic tools, a voice and an unshakable belief in their cause. And they had pictures. Lots and lots of pictures. Our most powerful and universal currency, after all, is imagery. 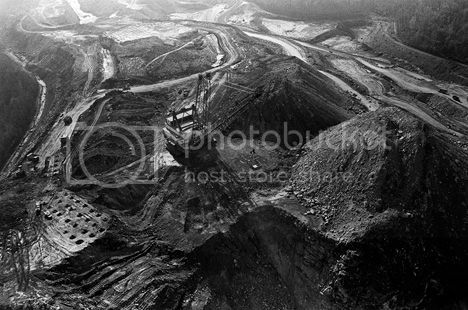 Nothing speaks more effectively to the devastation and pillaging of the Earth’s environment than photography. It is irrefutable, timestamped and jarring in ways words can never be. 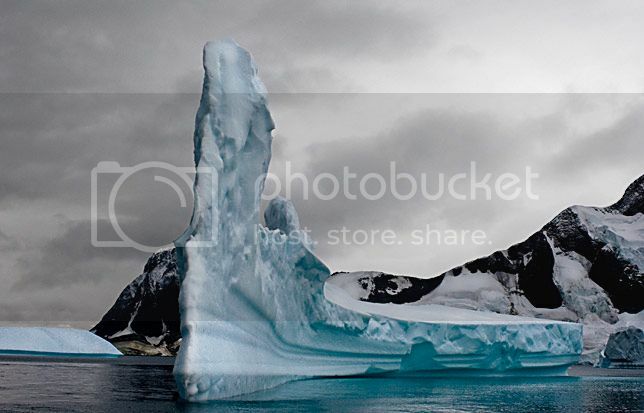 A glacier in Antarctica. Will it still exist in ten years? ©2008 Colin Finlay Photography, all rights reserved. So now that you’ve been shown, in pictures, in the resilience of a community that wouldn’t give up on their native land, and in the thousands of blog posts pouring in from around the world, what will you do? 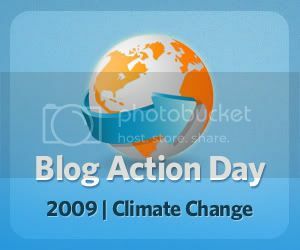 Take action by looking through this complete list of public and private environmental organizations from around the world, and informing yourself on different ways you can go green in your everyday life. Ultimately, it comes down to the old adage “Think globally, act locally”. Making small, easy-to-incorporate changes will compound to make one big difference. Take the bus to work tomorrow, or, if you live close to work, walk or ride the bike. Buy eco-friendly detergents, soaps and cleaning solutions. Take your own cloth bags to the market. Support companies committed to green productivity and manufacturing. RECYCLE. Think you can’t make a difference unless you’re writing emissions legislation? A group of native South Americans that had not encountered modern civilization before the late 1960s took on the Brazilian government–and won. Anything is possible. So take action today. Our planet depends on it. Follow ScriptPhD.com on Twitter and our Facebook fan page. Subscribe to email alerts for new posts on our home page. Zdrastvo to our Russian ScriptPhD fans! Da, absolutely, you can quote one of our posts, just please link back and credit ScriptPhD.com. Spaciba!